Bishop Gregory V. Palmer, president of the United Methodist Council of Bishops, addresses a joint meeting of the Connectional Table and the Council on Finance and Administration May 13 in Nashville, Tenn. UMNS photos by Ronny Perry. Bishop Gregory V. Palmer, president of the Council of Bishops, presented a five-point call to action to a joint meeting of the Connectional Table and the General Council on Finance and Administration. The plan was approved last week during the bishops’ spring meeting. Palmer said the current economic crisis has uncovered a need for bold action that will reorder church structure. The current 1970s organization is “not sufficient, nimble or responsive to the fast-changing 21st century,” he said. Palmer says the church is in a “sweet spot” after the 2008 General Conference clearly defined the church’s mission to make disciples of Jesus Christ and to concentrate on four areas of focus. The proposal calls for a steering committee of bishops and agency executives to design a plan for reordering the church. The plan will be presented to the November 2009 meetings of the Council of Bishops and the Connectional Table. The committee will include two central conference bishops yet to be named, plus Bishops Larry Goodpaster, Mary Ann Swenson, John Hopkins, Sharon Zimmerman Rader and Palmer, and agency executives Moses Kumar, Erin Hawkins, Neil Alexander, the Rev. Karen Greenwaldt and the Rev. Larry Hollon. The committee may be expanded to include additional people of color and a bishop elected since 2004. “This is not a done deal,” Palmer said. 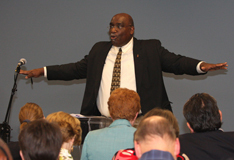 He said the church is in a “sweet spot” after the 2008 General Conference clearly defined the church’s mission to make disciples of Jesus Christ and to concentrate on four areas of focus: developing principled Christian leaders, creating new churches and renewing existing ones, ministering with the poor and improving global health by stamping out killer diseases of poverty. The call to action includes reducing the bishops’ salaries in 2010 to 2008 levels, shortening the bishops’ semi-annual meetings, and responding to the deficit spending for the 2008 General Conference and the projected shortfall of more than $3 million for the next General Conference. Take responsibility for telling the stories of the many positive ways the four areas of focus are being implemented around the world. Collect information about how the church is responding to the global economic crisis. Work with the United Methodist Board of Pension and Health Benefits to complete the Central Conference Pension Initiative goal of raising $20 million. Raise $75 million by 2012 for the Global Health Initiative. Church officials praised Palmer’s appeal.